I have added some links for the book and button. There is another source for the book in the comments. This idea has been brewing in my mind for quite some time. A while ago I won a set of Hannah's MiniMe Paperdolls for each of my girls. They came so beautifully packaged and printed on such quality paper that I hesitated to allow my girls to go at them with scissors! But of course what good would they do sitting in the closet all the time? Along with the paperdolls, Hannah also sends me the Outfit of the Month email, a file that I can print off with the "in season" outfit. I look forward to each month and print off more than one so there won't be arguments over who gets to "wear" it first ;). I was particularly taken with one of the spring outfits and decided it needed to worn by someone of more substance than paper. Divine was the lucky recipient. I added some hand stitching (french knots) around the neckline and chain stitched no big dill down the back. I happened to have this blue polka-dot fabric in my stash already, just about a quarter of a yard. With the simplicity of the dress, I chose a button full of character in the back. Divine is really petite for her age, so I think I'll shorten the sleeves, but all in all, I am pleased with the likeness of the MiniMe Paperdoll. I am thinking of doing a few others now...that is if this baby will stay put. no sleeves to set, no lining, no facing, no zippers, no buttonholes. Just 3 pieces and some bias tape. Nice. You might recognize the flower from Not Martha. I used some super thick wool felt. To glue each petal I followed her directions of fabric glue and clothespins holding them in place, but ended up using hot glue to fasten them to the back because the felt just drank that fabric glue up! Slurp! 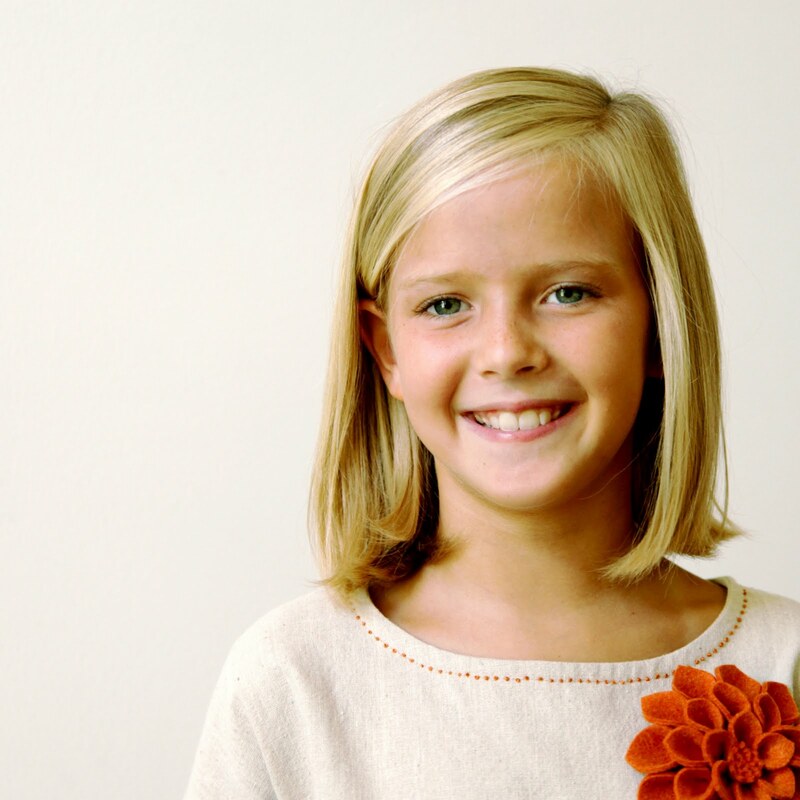 Hannah gives you all sorts of options to order your own dolls, customizing them to your child. Check them out here. Right now she is offering free membership to the Outfit of the Month Club for an entire year! With any purchase, just mention in "notes to merchant" that you came from no big dill and your membership will be free! And I won't tell if you just want to order a doll that looks like you for you, to play with during nap time. Pearl, in true Pearl fashion, was disappointed that I didn't make the shoes to go with the dress, and began giving me suggestions on how I could. **Sigh** Such high expectations from these baby dills. More on the book I used. It is all in Japanese and you have to trace your pattern pieces, but anyone who is familiar with basic clothing construction shouldn't have a problem, using the illustrations as guides. I found three copies of it online here, here and here. For more on Japanese Pattern book reading, I have a post here. The button was sent by a kind reader who is aware of my obsession affinity for fun buttons, but can be found at M&J Trimming here. They also have some cute red flapper buttons from fabric.com here. oh, this is like my dream come true! i'm always saying that i wish hannah designed REAL clothes. and better yet, that they came in MY size! ;) amazing job! This is so cute! Great job! Your little girl is adorable too! Stunning! Where can I get that book with such a gorgeously simple pattern inside? just gorgeous - as always. And I would love to take a closer look at that book...do you know where we can find it? Lovely!! The polka dot tie/sash is so fun. I like the orange and the no big dill. Sounds like my kind of pattern too- no sleeves to sew in and no zippers and buttonholes. precious. great job. she is a doll herself. Love the flower too! Absolutely beautiful work... as always. Oh my gosh katie! I'm dying over this! I have those dolls for my girls and one for me too! We adore them and I always hesitate before cutting them too. They are so gorgeous! I'm so in love with that button though! Seriously!! Where did you get that button!!!!! Wowsa! Great job as usual you are ahhhhmmmazing! Oh, Katie the dress is perfect! I am sure Hannah will be touched to see her creation reinvented in fabric. Well done. I love this! The simplicity of the dress is so nice. I'd like to have something like this. And the embroidery on the neckline is a perfect touch. How beautiful! I love the No Big Dill stitched down the back - so clever. I'm just working on a pillowcase with names embroidered on them.. .painstakingly slowly in my case and not as neat as your stitching. Amazing. 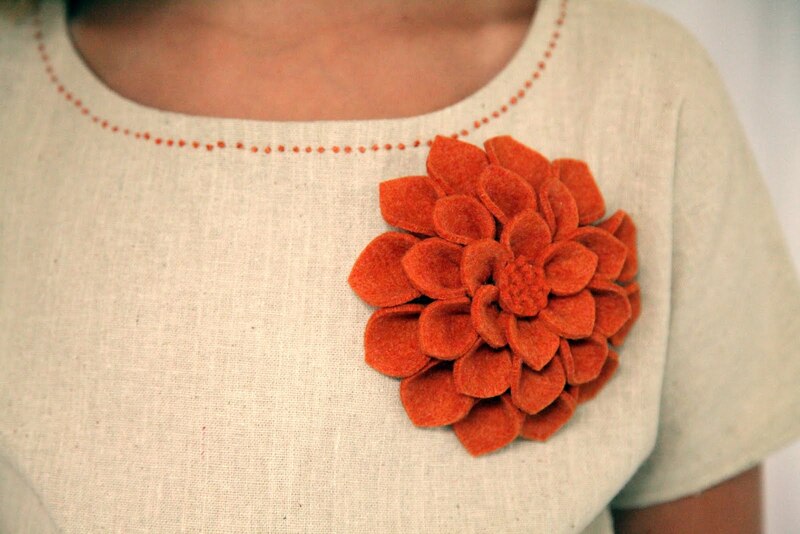 I love the french knots and the button. What a great book. I wonder if I could work around the German? This is MY dream come true...Katy Dill making one of my drawings come to life on one of her beautiful girls! LOVE how it turned out Katy! The button, Katy...THE BUTTON!!! Also, to answer Allison, the Outfit of the Month is free with any purchase. So cute! This is such a timely post as I have had that first Japanese pattern book for a couple of months and just started on one of the patterns yesterday. I'm so glad I ran across your tutorial as I did not add the seam allowance when I traced the pattern, just assumed it was included. Fortunately I have not cut the fabric yet!I love your blog, you are so talented! 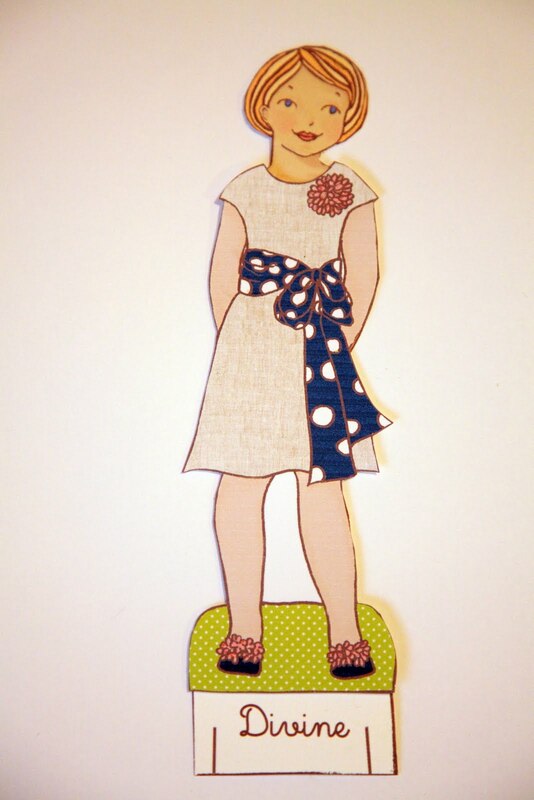 That is the most adorable dress ever... and the matching paper doll? Perfection! I must. MUST. get some of those dolls for my girls! Once again, I need that dress in MY size! So fun and Divine looks too cute. Love your creativity. I dont know if you have visited here but this girl loves orange!! 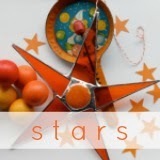 Thought about you as soon as I saw her blog header. Really hoping that you are still checking the comments. This is THE dress I've been looking for to make for my daughter's baptism next week. I've been staring at it, trying to figure out how it is just 3 pieces and I just can't wrap my brain around it. Could you tell me what the 3 pieces are? I think once I have that figured out, I should be able to come up with one. simple and so pretty! i would also like a link to where to get the book :)! thanks! no big dill - your're awesome!! !